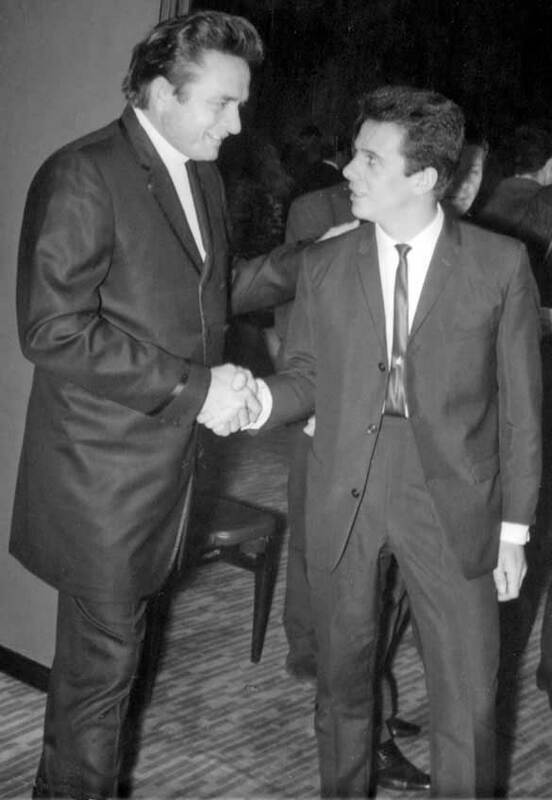 I get to meet the Man in Black, Johnny Cash, at the Royal Garden Hotel, Kensington, in London, 1968. Photograph © Billy Crallan. 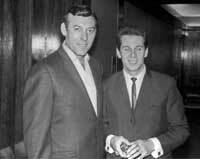 With Buck Owens in Liverpool in 1966. 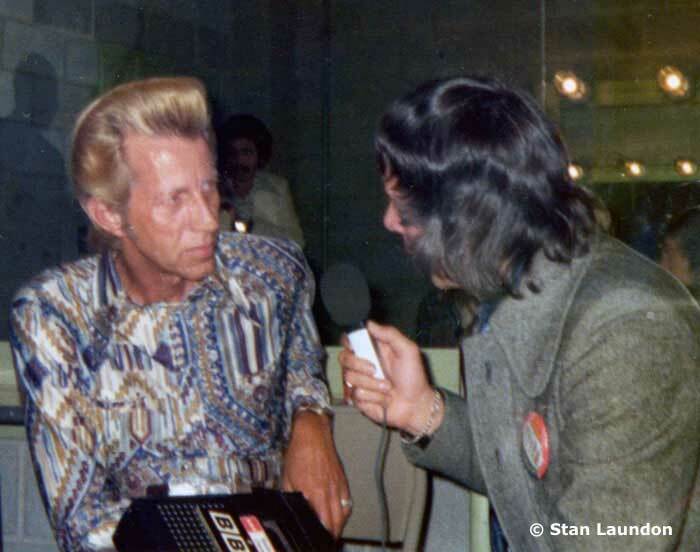 Buck is reading a copy of the English country music magazine "Opry" which later changed its name to "Country Music People." Notice Loretta Lynn on the back cover! I am on the extreme right but I have no idea who the other gentleman are, do you? 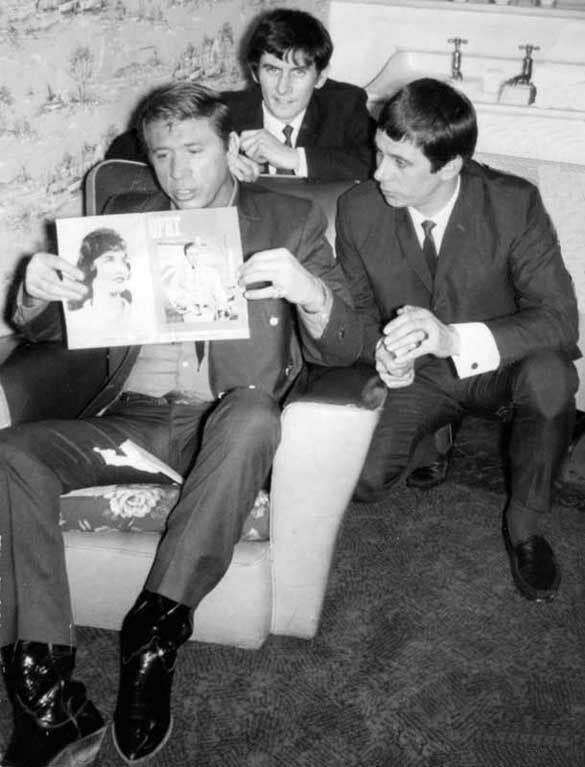 Another treasured photograph of Buck Owens in Liverpool 1966. 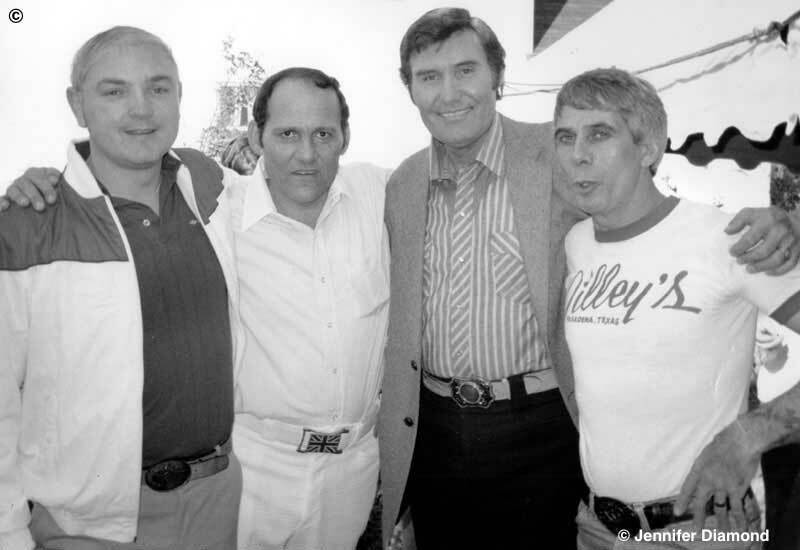 The gentleman in the centre of the photograph is fan, John Gregory from Tyneside with me on the right. 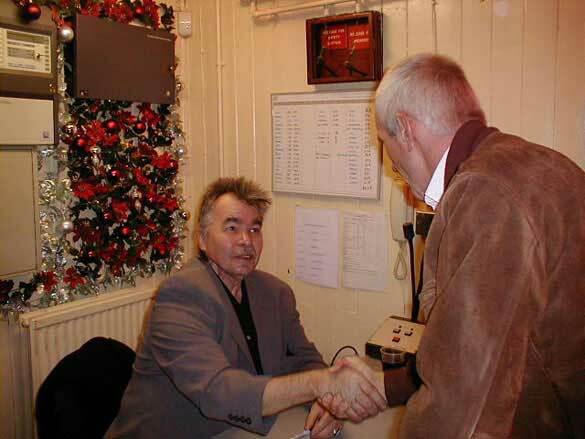 This photograph was taken in December, 2001, at Newcastle Opera House with a man I have admired for many years – John Prine. I flew all the way from Spain, suffering with a real bad cold at the time, just to see him in concert. It was worth every peseta. John was on stage for 140 minutes and spoke to all the people who stayed back to meet him. He chatted freely, posed for photographs and signed autographs. 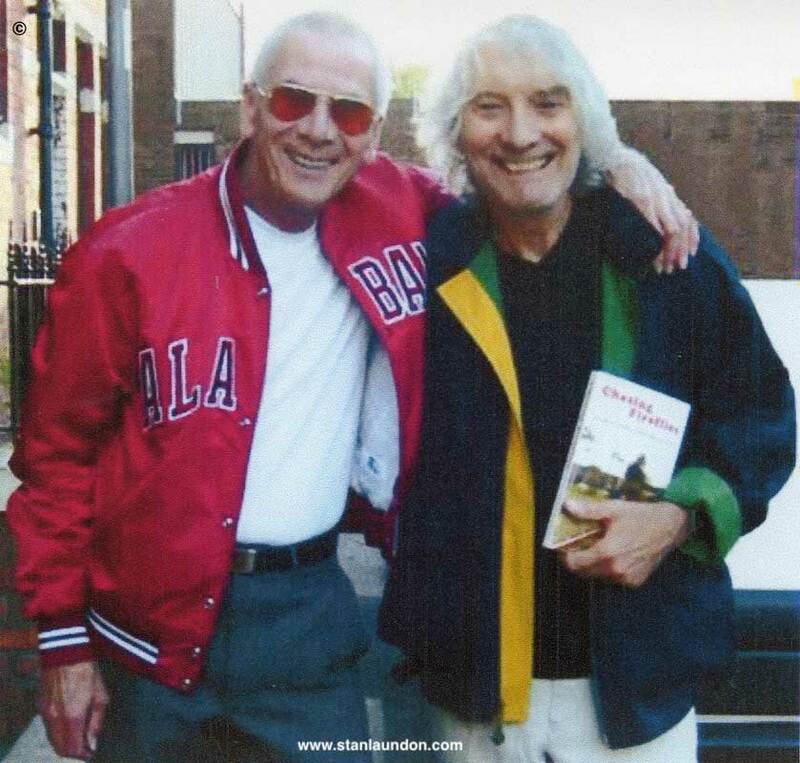 He even said he had read about my pending visit on his web site! Photograph by Gary Smurthwaite. 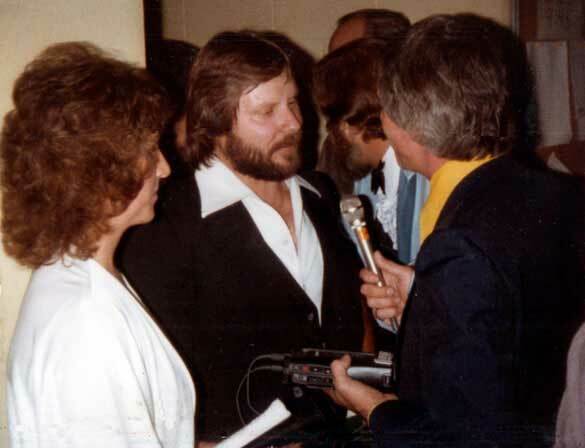 Moe Bandy discusses his song "It's A Cheatin' Situation." Joe Stampley is very happy with his award. 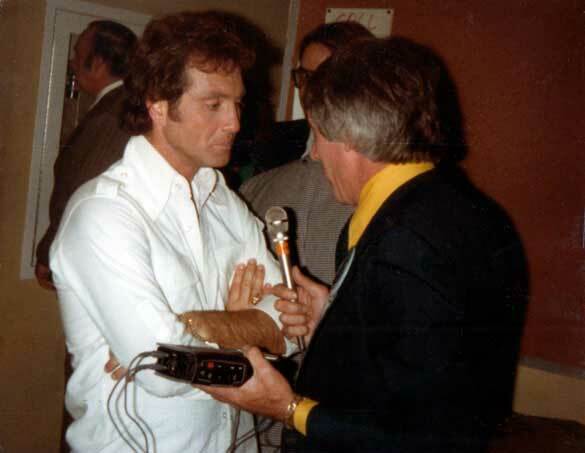 Larry Gatlin said he had not spoken to many English radio people. 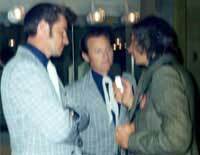 Moe Bandy, Joe Stampley and Larry Gatlin were photographed backstage at the Grand Ole Opry in Nashville, Tennessee, October 1980. 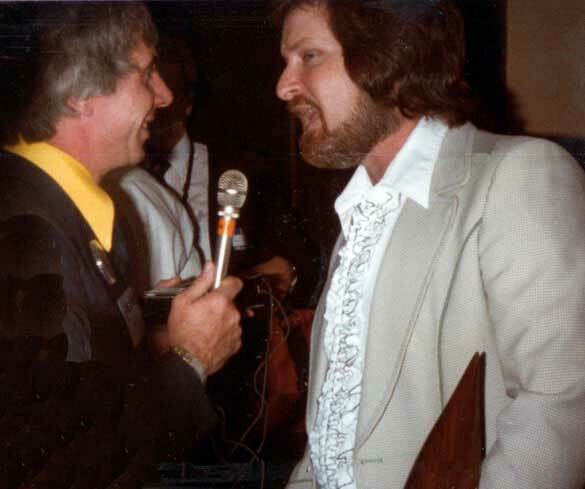 This was the year that Moe Bandy and Joe Stampley were voted "Vocal Duo of the Year" by the Country Music Association. 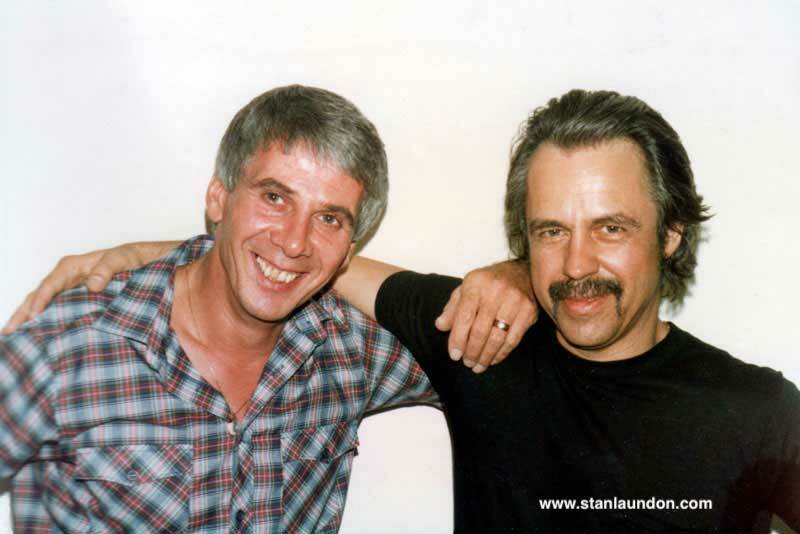 With the guitar chief, Chet Atkins, in Middlesbrough, England. Photograph by Tommy Loftus. 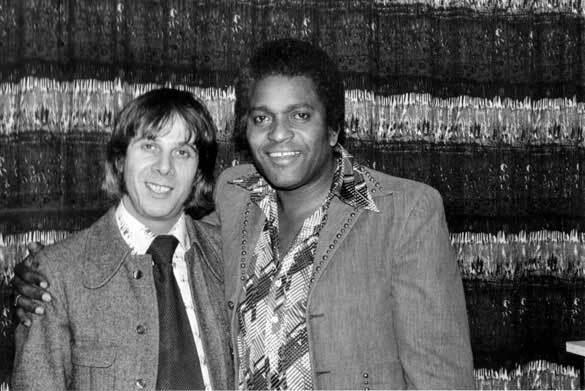 With country music star Charley Pride. 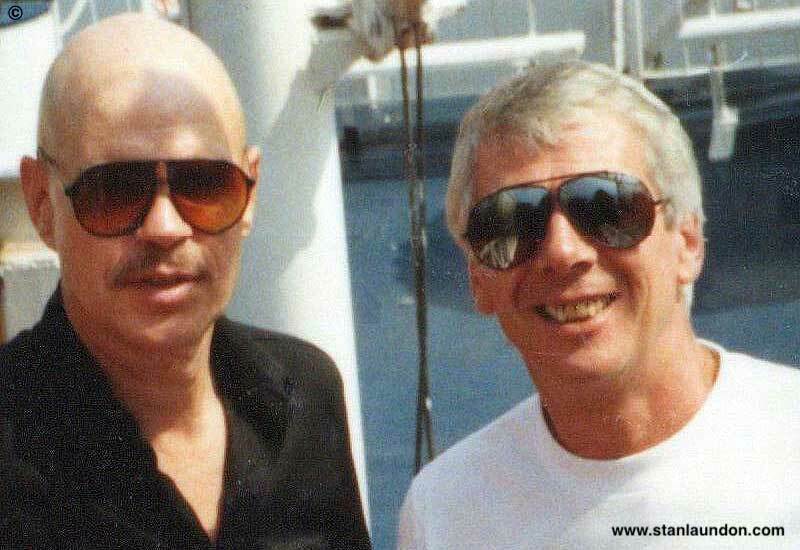 This was taken at the BBC Radio 2 "Country Club" Studios in London. Photograph by Tommy Loftus. 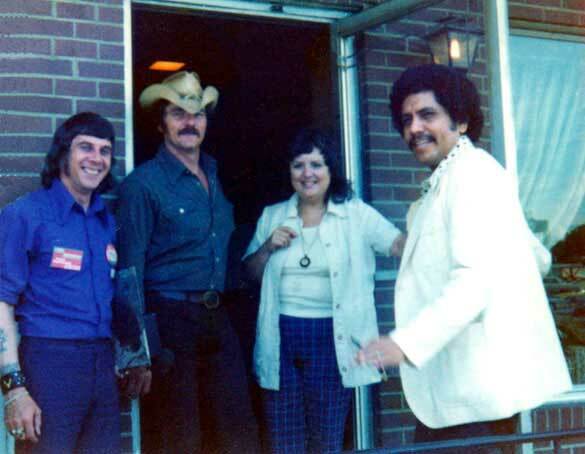 More good memories of my visit to Nashville, Tennessee in 1974 with Ed Bruce, Patsy Bruce and agent Gus Barba at the Biltmore Hotel on Franklin Road. Photograph by Shay Brogan. 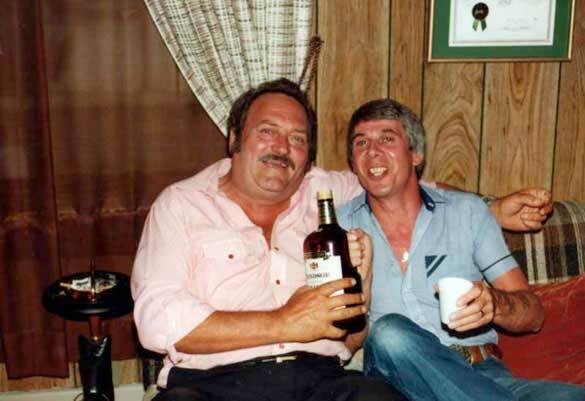 Celebrations for the late Carmol Taylor at a birthday bash at his Music Row office in Nashville, Tennessee in September, 1982. Photograph by Jay Diamond. 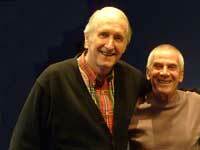 Carmol, Sonny Wright and me in a party mood after a few drinks - well, certainly Carmol and and I were! Photograph by Jay Diamond. 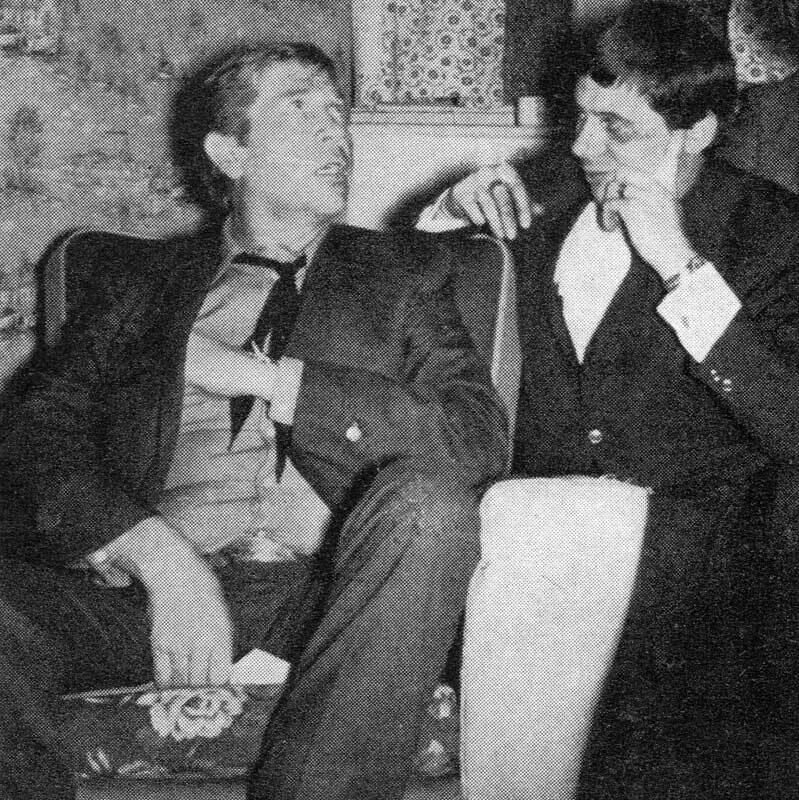 This photograph was taken at the Acklam Hotel, Newport Road, in Middlesbrough. 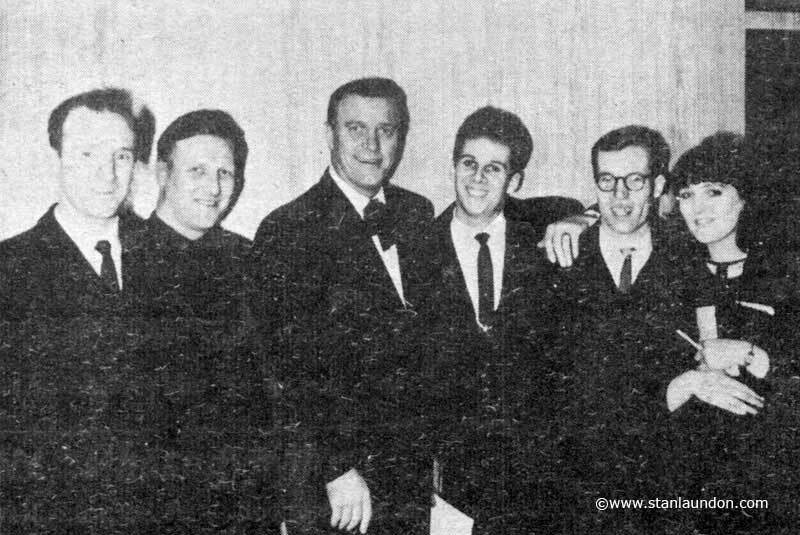 It shows Tony Jackson of the Shotgun Duo, Eric White, Stan Laundon, the other band member of the Shotgun Duo - but we don't know his name - Sye Maddison, Steve Young and Art Marshall. 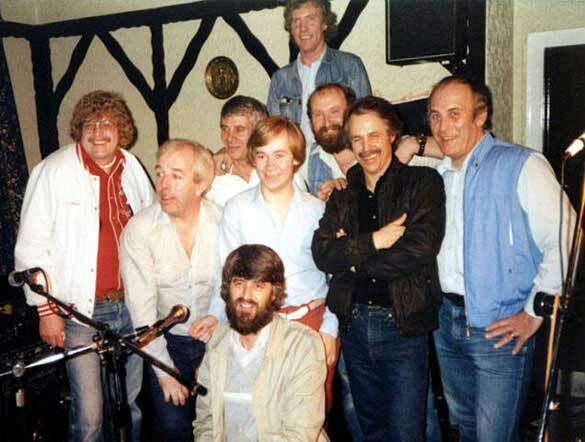 Bob Allison is at the very top of the photograph and Peter John Bergg, ex-Radio Tees country disc jockey, is at the bottom. 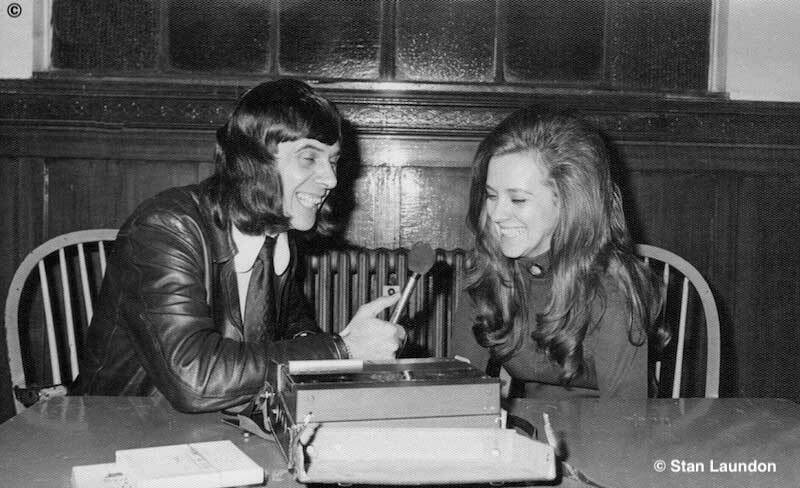 Relaxing with Connie Smith in Glasgow, Scotland, in 1973 on the Faron Young Tour. 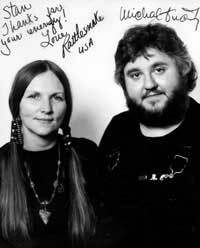 I believe that Connie has one of the greatest female voices in country music. As I've had the pleasure to have been in the company of many country music stars, or personalities, I've reduced the size of some of the photographs I have acquired and placed them here as thumbnails. To see a larger size of the photograph of your choice, click on the image you'd like to see. 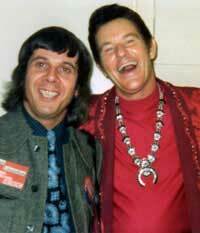 Buck Owens appeared in Liverpool in 1966 and this photograph of Buck and me appeared in The Opry magazine in 1966. With Carl Perkins when we were both a bit younger. This was taken at the Royal Garden Hotel, Kensington, in London, 1968, when Carl toured with Johnny Cash and June Carter. Photograph © Billy Crallan. 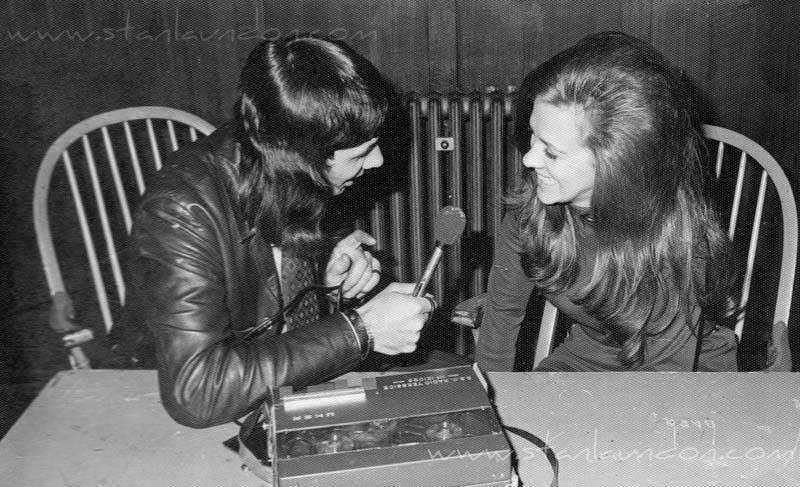 Rattlesnake Annie McGowan with Czech country singer, Michal Tucny. Annie signed this for me on November 5th, 1982 after we worked together in Scarborough, England. 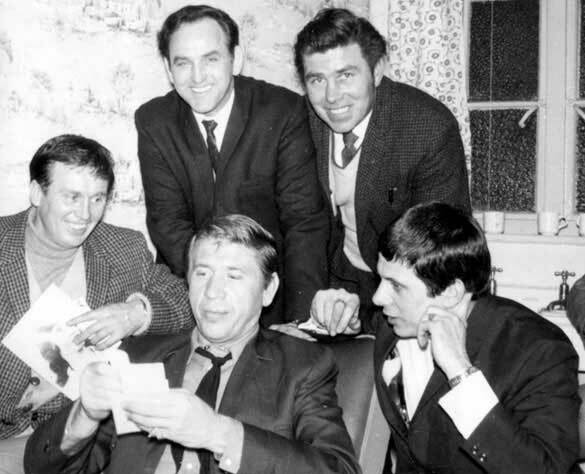 Former Leyton Orient footballer, Joe Elwood, with Charles Benson, editor of the magazine Country & Western Roundabout, country star Eddy Arnold, me, journalist John Stoten and country music fan Pauline Bennet in London 1966. 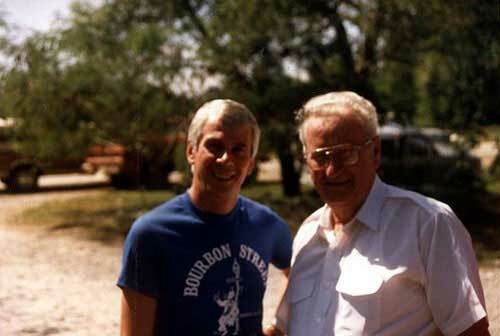 With singer & songwriter John Riggs down by the Cumberland River on my last visit to Nashville, Tennessee, in September 1991. Steve Young in Guisborough, England 1983. Cajun artist Dewey Balfa taken in Eunice, Louisiana, September 1990. Doug Dillard in Leeds, in 1989. 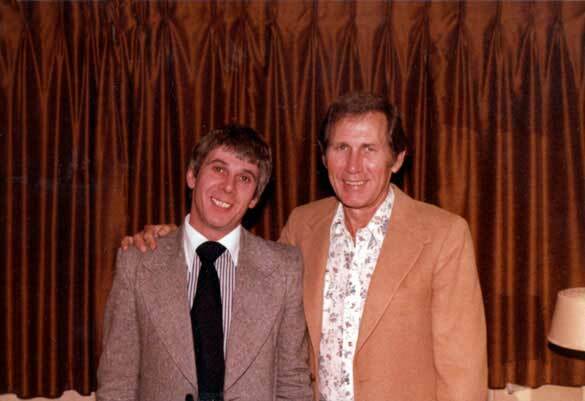 I have been a fan of The Dillards for as long as I can remember. Photograph copyright © Ian Edwards. 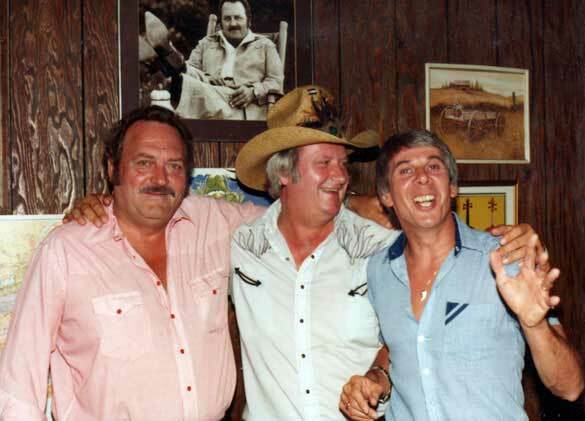 Radio disc jockey Joe Fish, agent and record producer Jay Diamond, singer Billy Walker with me wearing a Gilley's tee-shirt in Nashville, Tennessee, October 1983. Photography by Jennifer Diamond. 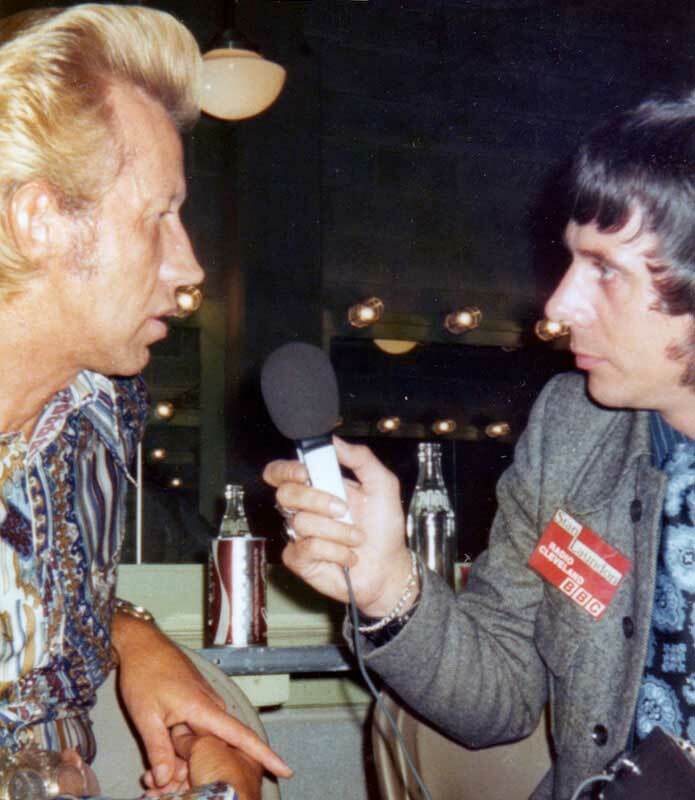 Porter Wagoner at the Municipal Auditorium in Nashville, Tennessee, June 1974. Photographs by Shay Brogan. 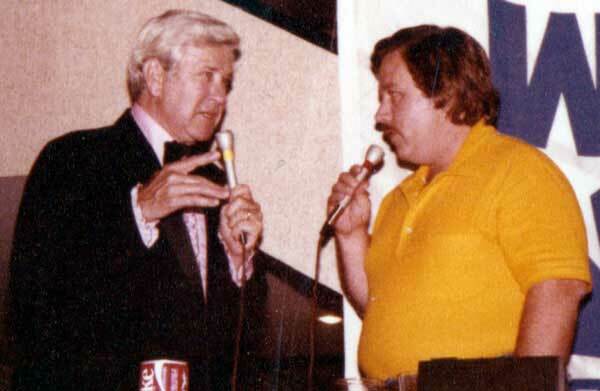 Freddie Hart at the Municipal Auditorium in Nashville, Tennessee, June 1974. Photograph by Shay Brogan. Sadly, the quality of this photograph is not brilliant but great to meet two wonderful exponents of bluegrass music, Jim & Jesse McReynolds. Photograph by Shay Brogan. 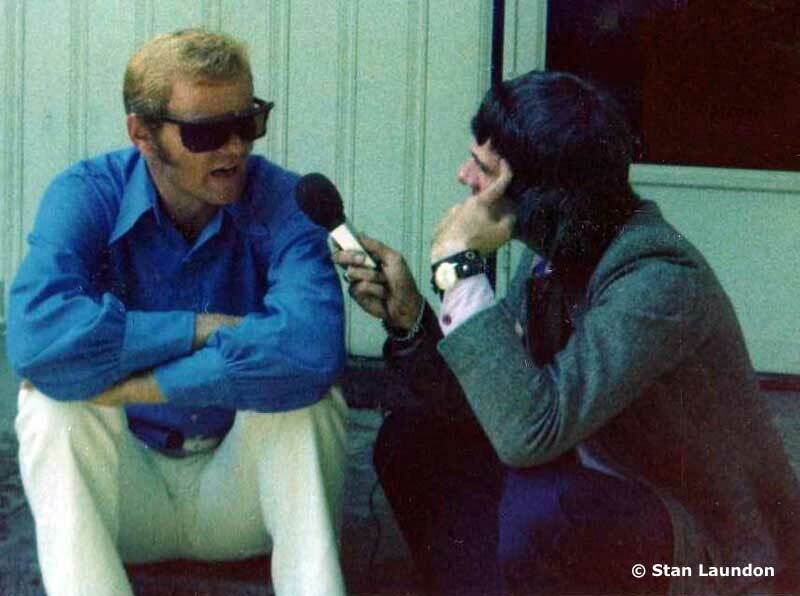 With Jerry Reed outside his Music Row offices in Nashville, Tennessee during my first visit in June, 1974. Photograph by Shay Brogan. 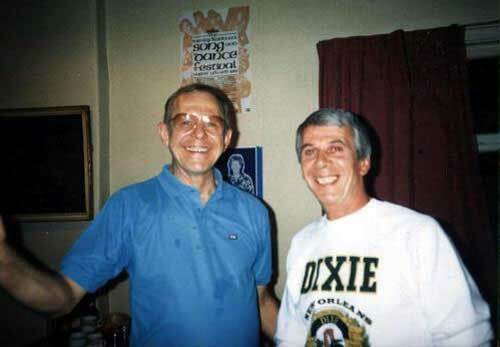 On one of my many trips to Nashville I was fortunate to see John Conlee backstage at the Grand Ole Opry talking to Charley Pride. I also saw him conducting this radio interview at the Hyatt Regency Hotel. 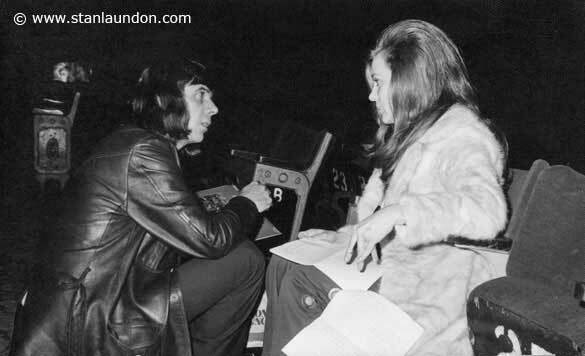 With the lovely Connie Smith in Glasgow, Scotland, in 1973 on the Faron Young Tour. With British guitarist Albert Lee in Hartlepool 2007. Albert is holding my book "Chasing Fireflies". 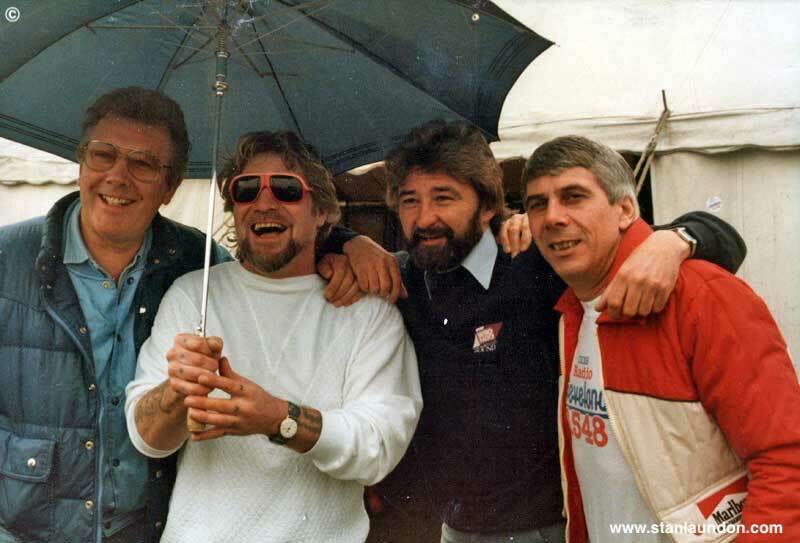 Former BBC Radio 2 "Country Club" presenter Wally Whyton, entertainer Raymond Froggatt, DJ Brian Clough and Stan Laundon at Great Aycliffe Show about 1985/86. American country music singer, and member of the Grand Ole Opry, George Hamilton IV at the BBC Tees studios in Middlesbrough, England, on September 10th, 2007.